When I was in college in Austin, most of my friends were vegetarians. As one of the few among us who actually liked to cook, I made a ton of meatless meals. I've never gone over to the other side, being awfully fond of a good Southern pulled pork BBQ sandwich or a slice of pepperoni pizza, but I still don't think every meal needs to be centered upon some kind of animal protein. 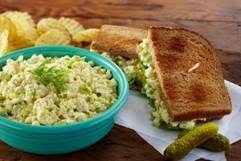 This eggless tofu "egg" salad was one of my personal favorites back in the day and I'm thinking about bringing it back for school lunches. Have you tried it? It's so good. Well, if you like egg salad. If you're anti-egg salad or mayonnaise, I would steer clear. Otherwise, you should totally give it a go. Makes great sandwiches or a nice protein source on top of a bed of greens. Especially spicy arugula!